I arrived home from 8 intense days of shooting (plus two travel days) in the incredible Glacier and Waterton Lakes National Parks at 3:30 AM yesterday morning. It was an awesome trip - I will eventually get through all of my pics and will post some of my favorites (I still need to post pics from my California trip earlier this year). At this point, I have most of the news posts caught up and have replied to all emails sent through Thu night. Note that I receive between 300 and 400 emails per day and use 3 layers of spam filtration to eliminate the garbage. I bulk-deleted over 3,300 filtered email messages today as the list was simply to long to thoroughly scan. Occassionally these filters generate a false positive - if I have not responded to your email, please send it again. My trip had a rough start. I had an early AM flight scheduled from an airport just over an hour away, so I set the alarm on my Droid X for 2:30 AM and went to be early. The phone rang and I pushed my wife to get up. After more than a little pushing, she turned over and said "It's 12:30!?" Half awake, I realized that the alarm had not gone off - I had an actual phone call - from the airline - notifying me that the first flight (of three legs) had been canceled. By 1:30 AM, after a long phone call, I had a new set of flights scheduled - from an airport 3.5 hours away. I was fortunate to get to the St Mary Lodge by 1:00 AM the next day (there are not many flights into Kalispell, MT - and fewer with seats available). The weather for the week was mostly excellent (warm for late Sep) with great cloud patterns on some days. The crowds were very light (most services were shutting down for the season) and the leaves were just starting to change. The week+ was a great experience - I highly recommend the trip! The Canon Digital Learning Center has posted Tutorials for EOS Storytellers. "Canon Live Learning and the imaging experts at stillmotion joined forces to deliver this series of EOS HD production tutorials, developed during Canon Live Learning workshops such as 2010's Canon Cinema Caravan and 2011's Deconstructing the Story: Light, Sound, Motion, and EOS HD"
"These tutorial videos give an inside look at what Canon Live Learning students experienced with the creative and technical leaders of stillmotion during these remarkable programs." September 28, 2011, SAN FRANCISCO, CALIF.: – JOBY is pleased to announce the launch of three new portable tripods to extend the innovation of the massively popular GorillaPod product line: the GorillaPod Micro 250, GorillaPod Micro 800 and GorillaPod Hybrid. The three new products are designed to meet the needs of today’s digital camera consumer, whether an enthusiast who shoots on-the-go with a point-and-shoot camera or prosumer sporting the latest compact system camera. Forever at your camera’s side, GorillaPod Micro is the indispensable companion for your point-and-shoot as the first always-on tripods that offer the stability, range of movement and versatility of full-size supports. Elegantly concealed beneath the base of the camera, the sleek form is convenient to carry and easily fits in any camera case or pocket. The aluminum and zinc alloy construction is engineered for dependable stability, quick deployment and precise ball positioning. Plus, the colorful rubber grips provide rock-solid footing on any surface. Now you can capture crisp low-light landscapes, join group portraits and record time-lapse party scenes, wherever your adventures take you. The GorillaPod Micro series represents a revolution in camera positioning and stabilization on-the-go with sleek, always-on tripods that feature a machined aluminum positioning ball with up to 36° of movement in any direction. The GorillaPod Micro 250 supports point-and-shoot cameras weighing up to 250g (8.8 oz. ), while the GorillaPod Micro 800 supports hybrid cameras weighing up to 800g (1.75 lbs.). Designed for the rapidly growing segment of compact system cameras (CSC), the GorillaPod Hybrid supports cameras weighing up to 1kg (2.2 lbs.) and is the perfect versatile tripod for the demanding, active photographer. The flexible, wrappable legs provide rock-solid stabilization on any surface and integrated aluminum ball head (±90° tilt, 360° pan) enable precise positioning to capture professional-quality images without the size and weight of a traditional full-size tripod system. Whether you’re staging a last-second street portrait, shooting time-lapse photos or recording stable, shake-free video, GorillaPod Hybrid unleashes the power of your hybrid camera. The $19.95 GorillaPod Micro 250 is available in grey, red, and blue. The GorillaPod Micro 800 retails for $29.95 in grey, while the GorillaPod Hybrid is available in grey and red for $39.95. All three new GorillaPod products are available for purchase today at popular photography, consumer electronics, outdoor retailers and internet stores, including Adorama, Amazon.com, B&H and more. The Lensbaby Movie Maker's Kit (press release) has been announced. For your email address, PhotoShelter will send you a free PDF guide: Selling Fine Art Photography. LAKE SUCCESS, N.Y., September 27, 2011 – Continuing its commitment to environmental responsibility and sustainability, Canon U.S.A., Inc., a leader in digital imaging, announces a new nationwide inkjet cartridge recycling program. Designed in collaboration with FedEx Office®, Sims Recycling Solutions and Close the Loop, this program utilizes the best environmental practices in treatment of recyclable materials. Canon PIXMA printer users can now drop off empty genuine PIXMA inkjet cartridges at more than 1,600 FedEx Office Print and Ship Centers across the United States. From FedEx Office locations, cartridges will be consolidated by Sims Recycling Solutions, who specialize in the large-scale processing of electronic waste. After being consolidated by SIMS Recycling, the Genuine Canon ink cartridges go to Close the Loop, a "material recovery" company specializing in the recycling of inkjet cartridges. 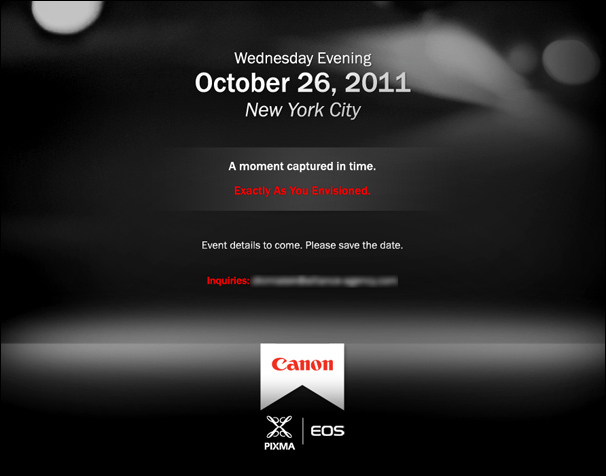 This program will be free of cost to all Canon consumers. "With the rise in consumer environmental awareness, Canon is pleased to offer customers the opportunity to participate in this national recycling program," said Yuichi Ishizuka, executive vice president and general manager, Imaging Technologies and Communications, Canon U.S.A. "Environmental responsibility and awareness have always been a top priority for Canon, and recycling is one of the simplest yet most beneficial aspects of this." The recycling program will tie into the Canon Generation Green initiative that focuses on helping to reduce the environmental burdens in all stages of a product's lifecycle. Generation Green is designed to provide business partners, customers and consumers a way to identify and learn about the various eco-conscious features and solutions that Canon has to offer, including possible cost savings through energy efficiency. In addition, components from the recycled cartridges can be turned into materials for other products. Close the Loop's innovative products include felt-tip pens and markers made from inkjet plastics and inks; industrial colorants made from recycled ink; recovered metals that can be recycled into new steel and aluminum ingots; and scrap plastics that can be turned into the company's synthetic "eLumber" and various eLumber products. • Support for RAW images captured with the Nikon 1 J1, Nikon 1 V1, and COOLPIX P7100 has been added. • Information for lenses used with the Auto Distortion correction function under Camera & Lens Corrections in the Develop section of the Edit List has been updated. • When the Auto Lateral Color Aberration function under Camera & Lens Corrections in the Develop section of the Edit List was applied to RAW images, gray edges were, in some rare cases, displayed in some portions of the subject. This issue has been resolved. • Support for the Nikon 1 J1, Nikon 1 V1, COOLPIX P7100, and AW100 has been added. • Support for the Smart Photo Selector and Motion Snapshot functions built into the Nikon 1 J1 and Nikon 1 V1 has been added. • All images captured in Smart Photo Selector mode, or just the “best shot” in an SPS series, can be displayed. • Playback similar to that of camera playback is possible for Motion Snapshot files. • Motion Snapshot files can be uploaded to my Picturetown. • An “exclude” option has been added to ratings. This new version of the Camera Raw plug-in replaces the original one that was installed with Adobe Photoshop CS5, Adobe Photoshop Elements 9 and Adobe Premiere Elements 9 software. Visit the Camera Raw page for a complete list of supported cameras. Update: Lightroom Journal has more details about these updates. Nikon Capture NX 2.2.8 (USA) / (Europe) is now available.